Barcelona have signed Spain left-back Jordi Alba from Valencia for £11.2m on a five-year deal, subject to a medical. 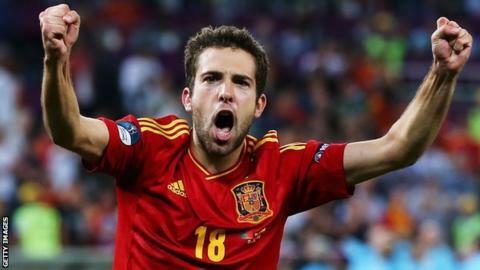 Alba, 23, has impressed in helping Spain to Sunday's final of Euro 2012 and will move back to the club where he started out at youth level. "He is young, quick, skilful and stands out for his attacking spirit. He often poses a headache for rival right-backs," Barca said on their website. Jordi Alba started out at Barcelona's famous La Masia academy before being released and joining UE Cornella. He was then bought by Valencia for 6,000 euros. "He has become one of the sensations of the tournament [Euro 2012]." Alba has played each of Spain's five games in Poland and Ukraine and has been key for them in defence as well as in attack with his runs down the left wing. He set up Xabi Alonso for the first goal in the 2-0 win over France and has 10 caps for his country. Alba was also a pivotal figure for Valencia last season as he helped them to third place in La Liga and a Champions League spot. He is the first signing for new Barcelona boss Tito Vilanova, who has taken over after predecessor Pep Guardiola left the club at the end of last season.